From the island of Luzon in the Philippines, it is closely related to Lilium formosanum and Lilium longiflorum. 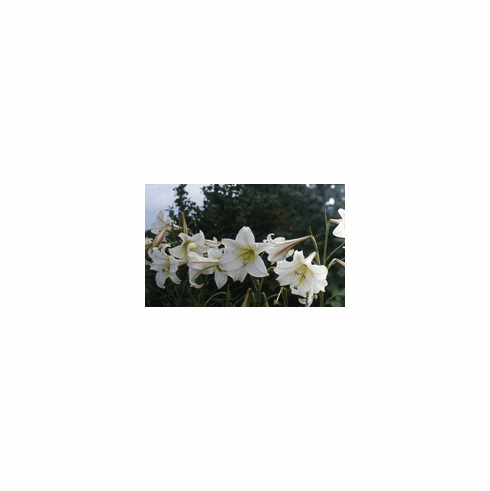 The long, funnel shaped, fragrant trumpet flowers are white and slightly tinted in green at the base. Short lived as it is susceptible to virus and not winter hardy, seed will flower in 18 months. It prefers a light, well drained soil and being that it is found in coralline limestone, would appreciate some lime added yearly to the soil. Seed often appears on seed lists. Photo insert #1 is of seed bed 8 months after planting. Most had single blooms 3 and 4 months later. Photo insert #2 provided by Marv Truhn.